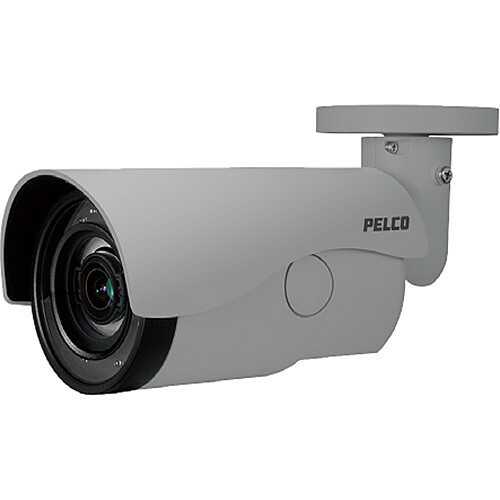 Watch over your property with the Sarix IBE Series IBE129-1R 1.3MP Outdoor Network Bullet Camera with Night Vision from Pelco. Featuring a 1/2.8" CMOS sensor and a 3-9mm 3x motorized varifocal lens, this camera captures video at resolutions up to 1280 x 960 at 60 fps in horizontal fields of view ranging from 113.7 to 38°. The camera is equipped with an IR cut filter and adaptive IR illuminators for night vision to an effective range of up to 98'. Moreover, the camera provides various autofocus modes to deliver clear, focused images regardless of scene or environment variations. The IBE129-1R has an SD card slot for edge storage and input and output connections for two-way audio communication. H.264 and MJPEG configurable streams allow you to optimize storage and bandwidth use, while ONVIF compliance ensures compatibility with a wide range of surveillance equipment.